Curious – ponder how quickly New Horizons Pluto mission evaporated from popular culture. Media hypes cosmic milestones for a day or two, the moment they stop trending, space exploration might try booking a booth at Comic Con. I wonder how many people could differentiate between New Horizons, Rosetta, Ceres…..
New Horizons left Cape Canaveral in January of 2006 – primary destination Pluto, with asteroid hat tips and cursory nod to Jupiter along the way. On July 14, 2015 New Horizons completed its first “fly-by” of Pluto – Pluto’s wonky orbit aside, an average of 6.09 billion kilometers from earth. Within days New Horizons tickled our fancies with thought provoking images of once a planet Pluto. This week NASA released New Horizon’s finest work, detailed jaw droppers worthy of a last hurrah. Turns out New Horizons is one plucky little probe, delighting mission control with “can do” tenacity (and enough remaining fuel) to forge far beyond wildest dreams. “Nice to meet your acquaintance Pluto, I must be on my way, 2014 MU69 awaits”. New Horizon’s fuel bonanza sent science to the Hubble Space Telescope. A billion miles beyond Pluto, Hubble identified “icy object” 2014 MU69 as a viable destination. This week NASA announced intent to reach it by 2019 – New Horizons is packing her bags while NASA waits for final funding approval. View larger. 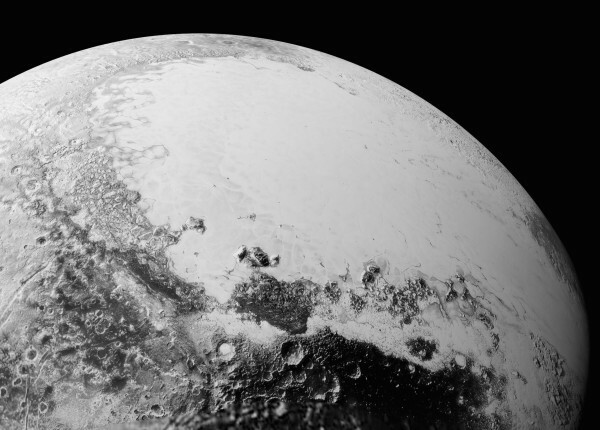 | Remember the beautiful image of the heart-shaped feature on Pluto? Here it is in closer detail. This image covers an area 1,100 miles (1,800 kilometers) across. Scientists call the heart-shaped feature Tombaugh Regio; it’s a smooth, icy plain. Image via NASA/Johns Hopkins University Applied Physics Laboratory/Southwest Research Institute. View larger. 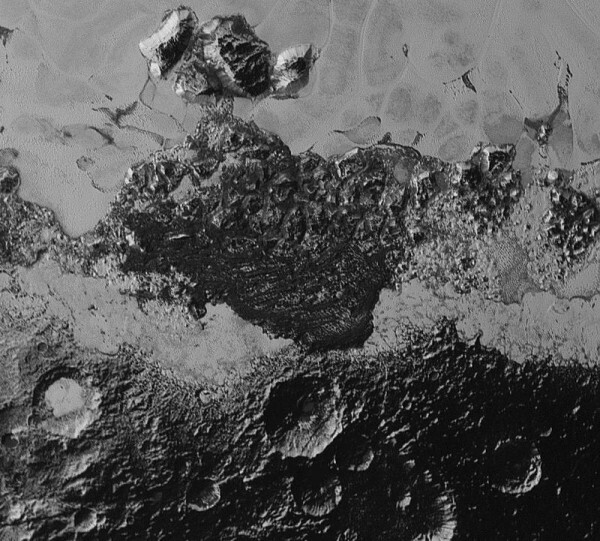 | Some regions on Pluto are much darker than others. Scientists aren’t sure why. Image via NASA/Johns Hopkins University Applied Physics Laboratory/Southwest Research Institute. This entry was posted in Space and tagged 2014 MU69, Kuiper Belt, NASA, New Horizons, Pluto, space. Bookmark the permalink. In all fairness to popular culture, finding some place in a citizen’s daily life where Pluto has immediate relevance is not the easiest thing to do. And I think we both know that on a macro scale contemporary citizens don’t seem to be too keen on deep thought. They’re more interested in whether Kim Kardashian has regular bowel movements and the field goal attempts of some obscure football team. I mean, come on, what possible relevance can science have in our everyday life? It is a bit sad that we all become somewhat blase. Yet who could forget July 20th 1969? A great many people as it turns out! But thanks to the unflagging enthusiasm of people like you, Notes, you are able to reignite the Wow factor. We are living in a world of hyperfast media with nanoscopic attention spans. Since we also live in a world of accelarting science and technology, there is always something to hold our wonder. What is the next awesome tweet to blow us away for a second..?